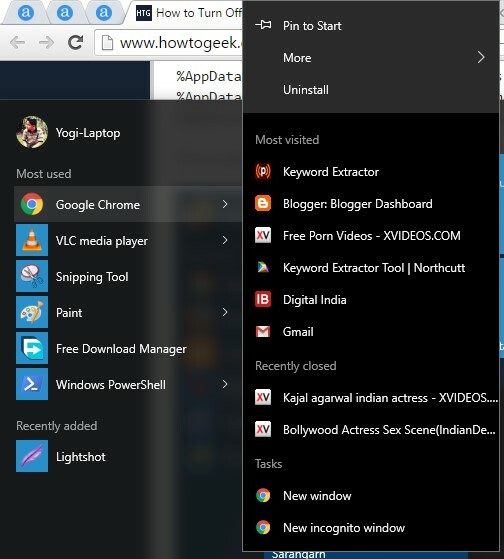 Recent items in the start menu and recent document list can speak many things about you in your Windows machine. Windows tracks lots of stuff like what document you have been using, what video or music files played recently, what programs you opened etc. If you have a personal computer, laptop or tablet then you don't have to care about it but what if you need to use shared computer at home, office or somewhere else? 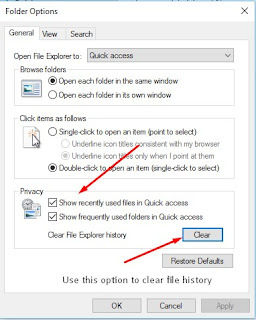 This recent document feature is already in Windows 7 and has included in file explorer in Windows 10 and Windows 8.If you have noticed your Quick Access menu in left side shows recently used folder and in the jump list shows the recent folders. Start menu also shows recently used programs, and Quick access menu shows frequently used folders as well. These things are not an issue if you are using your computer but in the case of office, schools or public places this may environment uncomfortable environment for privacy freaks user like me. Since Windows 10 has change file explorer's default folder from My Computer to Quick Access, and this one includes recent records and frequent folders. Where there your recent files are music, video, word document, they will be shown up there by Windows 10 including with folders you recently opened or pinned on the taskbar. 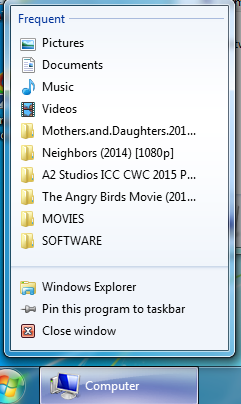 As you can see my browser history is clearly visible and recent folder list through taskbar's jump list. Recent item worked differently and shown because you can use them to pin to the taskbar for quick access. You can quickly turn off recent items from Settings > Personalization > Start. You can use Window + I to open Settings and then navigate to start tab under personalization. 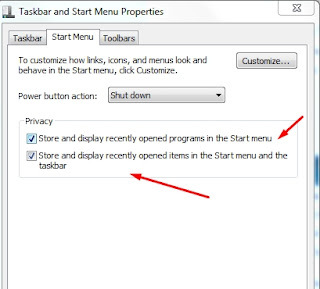 Now find and turn off "Show recently opened items in Jumplist on Start Menu or Taskbar" and "Show recently added apps." 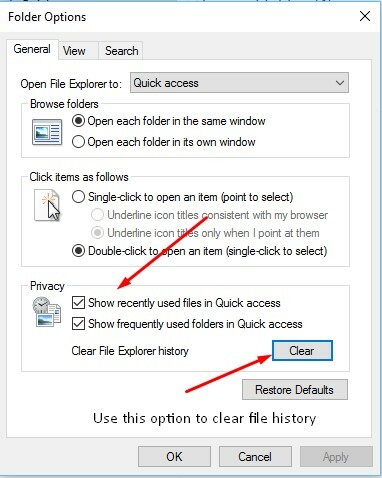 For Quick access menu, you can use folder option from ribbon in file explorer and uncheck the recent items options in privacy section. There are lots of things have changed since Windows 7, so if you still love Windows 7, then you need to try a different method to clear recent files in Windows 7. Below is a method for removing recent files in Windows 7 & 8. Right, click on Start menu. Switch to Start Menu Tab. There you can see "Recent Items." Uncheck the recent item menu and save the settings. 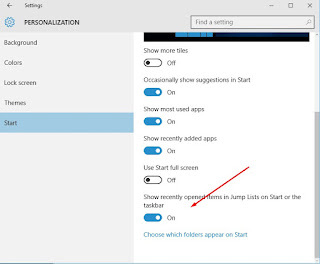 You can choose to show zero number of programs to show in jump list from start menu's customize option. Check the bottom of the first screenshot to see the option to show some items in the jumplist. Its not a permanent solution although, because Windows is still storing recent files history and if someone changed that setting then your list will be back. 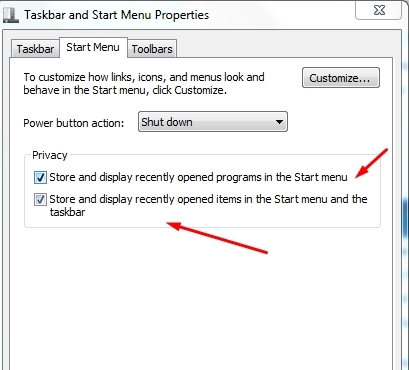 To stop Windows 7 to record your recent file history, you need to turn it off from Start Menu's privacy option. Follow these steps to prevent Windows recording your recent file history. Go to Start Menu Properties (Right click on the taskbar, Switch to Start Menu tab). Now Windows is not keeping any record of your recent files and programs.